Background and objectives Bloodstream infection rates of patients on hemodialysis with catheters are greater than with other vascular accesses and are an important quality measure. Our goal was to compare relative bloodstream infection rates of patients with and without catheters as a quality parameter among the facilities providing hemodialysis. Design, setting, participants, & measurements We used CROWNWeb and National Healthcare Safety Network data from all 179 Medicare facilities providing adult outpatient hemodialysis in New England for >6 months throughout 2015–2016 (mean, 12,693 patients per month). There was a median of 60 (interquartile range, 43–93) patients per facility, with 17% having catheters. Results Among the five batch-submitting dialysis organizations, the bloodstream infection rate in patients with a catheter in four organizations had adjusted risk ratios of 1.44 (95% confidence interval, 1.07 to 1.93) to 1.91 (95% confidence interval, 1.39 to 2.63) times relative to the reference dialysis provider group (P<0.001). 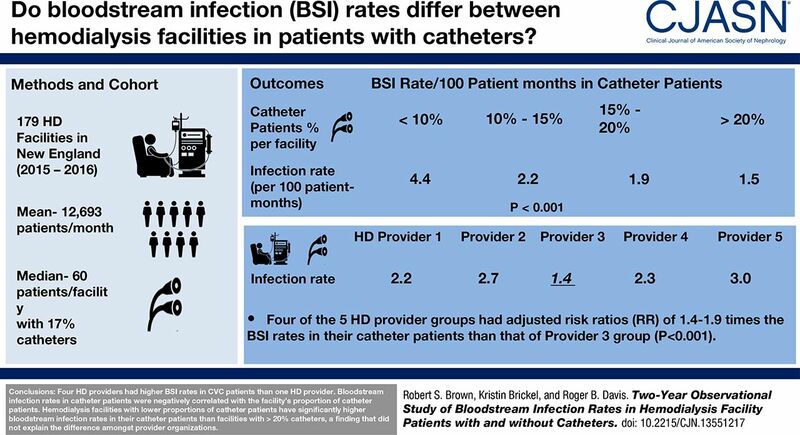 The percentage of catheters did not explain the difference in bloodstream infection rates among dialysis provider organizations. The bloodstream infection rates in patients with a catheter were negatively correlated with the facility’s proportion of this patient group. Facilities with <10%, 10%–14.9%, 15%–19.9%, and ≥20% catheter patients had bloodstream infection rates of 4.4, 2.2, 1.9, and 1.5 per 100 patient-months, respectively, in that patient group (adjusted P<0.001). This difference was not seen in patients without catheters. There was no effect of facility patient census or season of the year. Conclusions A study of the adult outpatient hemodialysis facilities in New England in 2015–2016 found that four dialysis provider groups had significantly higher bloodstream infection rates in patients with a catheter than the best-performing dialysis provider group. Hemodialysis facilities with lower proportions of patients with a catheter have significantly higher bloodstream infection rates in this patient group than facilities with >20% catheters, a finding that did not explain the difference among provider organizations.